One way in which excess global steel supplies are finding their way into the United States is through the growth in global supply chains, which have permitted some foreign producers to continue exporting unfairly traded products to the United States by sending that product through third countries for further processing before export. Many basic steel products from China (as well as downstream products such as OCTG pipe) are now subject to anti-dumping and countervailing duties in the United States. 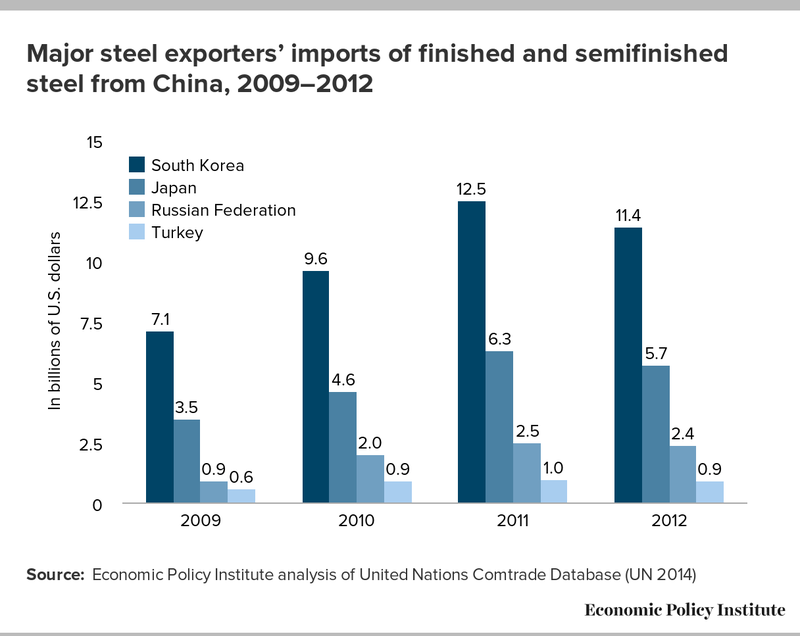 As U.S. steel imports from China have fallen in recent years, China’s steel exports to Korea and other countries have surged, as shown in the chart below. The Wall Street Journal reported that Chinese steel exports to Korea rose 29 percent, to 5.3 million tons, through May of this year. This is an important issue which requires future attention from both the administration and Congress. U.S. trade laws, which have not undergone major revision since 1998, may need to be revised to improve the enforcement of fair trade laws, and specifically to control unfairly traded goods from China and other countries that have been transformed in third countries, such as Korea. The Commerce decision regarding duties on OCTG imports is the first in a two-part decision-making process. Next, the International Trade Commission will decide whether domestic steel producers were harmed, or if they are threatened with injury from unfairly traded imports, and, if so, will make the tariffs permanent. Commerce’s decision to assess duties on Korean OCTG imports is a victory for steel workers, U.S. steel producers, and the millions of people whose jobs depend on the U.S. steel industry. In February, Commerce issued a negative preliminary determination that OCTG from was not being dumped (“sold in the United States at less than fair value”). U.S. steelworkers were forced to mount a “nationwide call to action,” to “ensure that our trade laws are fully enforced.” They were joined in this effort by U.S. Steel and many public officials, including more than 150 members of Congress and 57 Senators who signed letters to the Commerce Department about this issue. As Steelworkers President Leo Girard pointed out, this national campaign “should not be necessary to ensure that our trade laws are enforced.” U.S. officials should enforce U.S. fair trade laws to the fullest extent allowable under U.S. and international law. And the time has come for a complete re-assessment of U.S. trade laws to close loopholes and ensure that the law is enforced to the full extent intended by Congress and the president.